Senator Sonni Ogbuoji, the Ebonyi State APC gubernatorial candidate has told the people of the state to watch out for anarchy at the instance of Governor Dave Umahi relating to the election of March 2 that will bring an end to his rule of impunity. 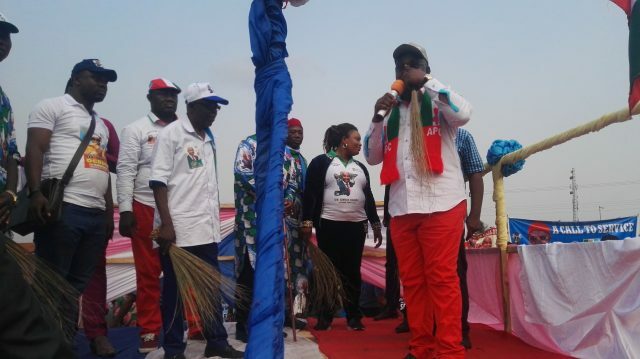 Ogbuoji sounded the warning at Isu, Onicha LGA of the state during his campaign tour on February 6 while addressing his supporters and people of the area. He reminded them that a statement credited to Umahi through his Director of campaign strategy that ‘there will be anarchy if he Umahi is not declared the winner of the gubernatorial election’ amounts to unconscionable incitement of the people and a declaration of war on the state its people. ‘It still surprises me how someone who claims to love his state he has immensely benefitted from and at the same time impoverished would be the one beating drums of war. ‘Umahi has forgotten that there were people in power as governors of the state before he came in and if his predecessors had taken the belligerent disposition like he does and shuts down opposition with a high-hand, he would not have been a governor. I am also appalled that someone who took oath to defend the constitution of Nigeria is inciting followers to resist arrest by law enforcement agencies. When did clear conscience start living in fear of accusation. Ogbuoji also lamented the spate of violence meted to members of the APC a day to his campaign in Onicha. ‘I am aware and was told of gunshots for hours last night prior to my campaign visit here to intimidate our supporters from coming out to receive us. I also heard announcement on the state radio threatening to punish any head of any school in Onicha that allows the school premises to be used by APC for campaigns just a day prior to our rally here, and I want to let Umahi know that this state belongs to all of us and his suppression and intimidation would rather harm him the more. Also during the campaign in Onicha, natives of the LGA and members of the party praised Ogbuoji for his impact on them as a senator. The speakers which include Dr. PCI Umoke, Princess Anne Agom-Eze and the APC women leader, Mrs. Nwanioke all counted out the health facilities, electricity projects, water boreholes, education support projects and street lights the senator attracted to Onicha and how the facilities have made life better for the people.